I got some good crafting time in this holiday weekend, which has allowed me to try playing in a new-to-me challenge: The Color Throwdown. With a name like that, it’s got to be fun, right? So the challenge from Color Throwdown was to use: crumb cake, silver, gum ball green, and white.. I didn’t have exactly gum ball, but I got pretty close. I didn’t see an “about” section, so I’m curious as to where they get their evocative color names and ideas. Maybe I’ll find out as I follow along. Learning & Improvement: I feel like I could have filled the green space better. 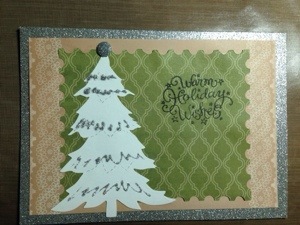 I need to pick up more holiday sentiment stamps so that I can fill up a larger space when needed. I also feel like the piece could have used a little distress or something. Somehow it feels like it’s missing a little detail or depth. Loving it: Despite not having the exact right green, I just love the way the colors came together! I think I’ll do more Color Throwdowns in future, because it’s so much fun to dig out papers that match the colors and see where the papers lead! 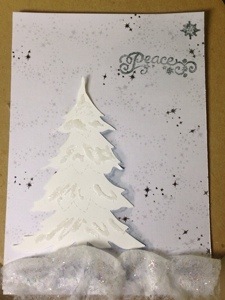 Inspiration: A week ago I created a card for a “white on white” challenge at Inkspirational. But I was a little disappointed with it, because my initial hope had been to create a landscape, but at that point I couldn’t think of anything in my stash to help me produce a landscape. So I ended up doing a more abstract white-on-white design. When I saw the “Winter Scenes” challenge on the Flourishes Timeless Tuesday Challenge blog, I knew I had a second chance to try to achieve the snowy, white-on-white landscape in my mind. I’m not sure why this idea didn’t occur to me in the first place! Learning: Why did I use the Deco Art glitter paint on the dryer sheet? I was hoping to get a tiny bit of color into the scene by using aroraborealis style glitter, but I feel it ended up looking a bit cheesy. It reminds me of the glittered blankets of polyfiber fake snow under my grandparent’s manger scene in the 80’s. Which could have been cool in it’s own right, if I had been going for a more retro-cute look. I also put on a bit of the blue Distress Inks on the dryer sheet for shadow, but I wish I had attempted it before sticking the dryer sheet on, because I think it would have been more subtle. Triumps: I love love love how the Perfect Pearls worked out. 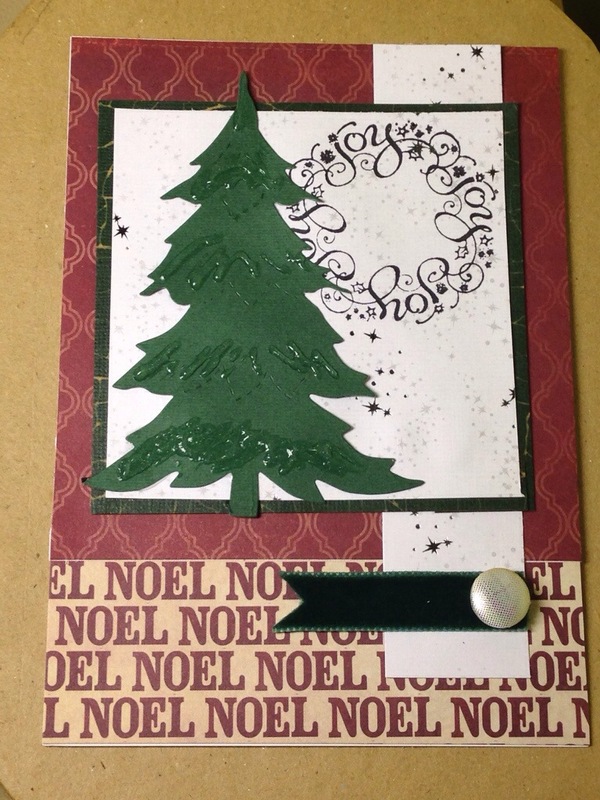 I had never worked with them before, and I found it to be really fun to stamp on the clear Perfect Medium, then watch the image appear when I dusted on the Pearls – kind of like a secret message! The effect was subtle, yet legible. I also like my shadow effect on the one side of the tree done with a Stormy Sky Distress marker, and a bit of Weathered Wood ink on a watered brush. This challenge comes from the Shabby Tea Room: “Gingham Country Christmas”, requiring the use of Christmas theme, gingham pattern, red, cream, and blue. For this card, I wanted to explore what happens when gingham gets a little grunged. But the problem was, I didn’t have any gingham paper, and I’m trying hard not to buy more paper at this point. Luckily, the gingham pattern has got to be about the easiest thing to make in Illustrator, and 50% of my day job is graphic design, so I know my way around the program. It’s a quiet weekend at home with my husband working on a research paper, so it was the perfect time to make more digital papers. I say ” more” because I’ve been fooling around with digital paper ideas for over a month now. I’d ideally like to make some for sale on Etsy, but I have a lot of questions about how other people use digital papers. This is something you can help me out with, dear readers! I’ve put up a survey over here along with a rainbow of free gingham digital papers that you can download if you wish. If you do take the survey, or leave a comment, then I thank you very much! When I first saw the “Pick a Sketch” Timeless Tuesday challenge at Flourishes, I assumed they were talking about using something that looked hand drawn, in addition to using one of the example layouts but none of the examples reflected that. I finally figured out that they were referring to what I thought of as a layout as the “sketch”. Regardless of my confusion over the jargon, the idea of trying a suggested layout seemed like a terrific way to get my creative juices going. 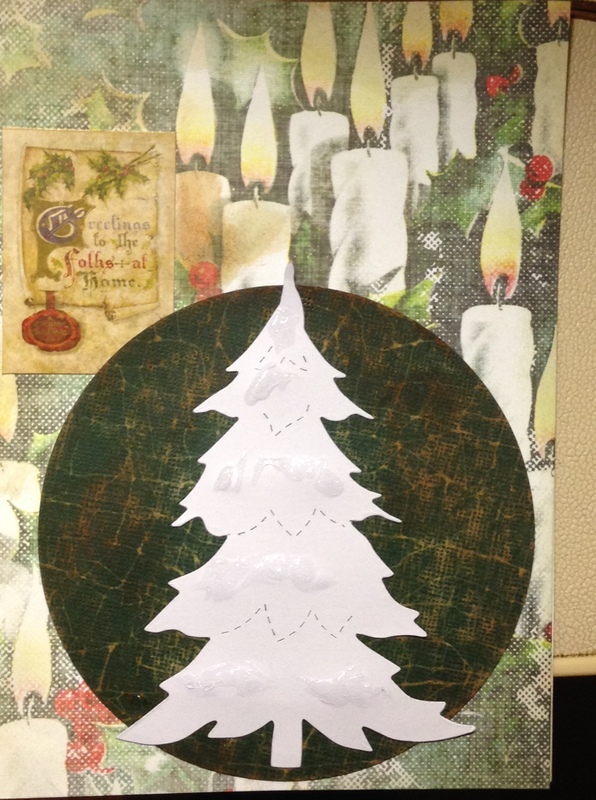 That’s a major reason that these challenge blogs are so appealing to me right now – I want to make all my own holiday cards this year, and the challenges are keeping me from having a creative block. Oh, and I’ve also recently won “Designer Spotlight” accolades over at Simon Says Stamp Monday Challenge blog, and I won a random drawing for commenting on a mystery blogger over at Flourishes winning one of the stamp set called Friendship and Flowers from their November release. So praise and prizes are also good motivators to keep me crafting and posting! Back to the “sketch”: two layouts were offered, and I picked the more square one, since they are quicker to cut without a die. It does make me want to pick up square and circle nested dies, though. I think they’d be a bit of a time saver. Doing a predefined layout was really fun, since it let me focus more on color and textures. It was also instructive, because it got me to work with a lot more layers than I previously have. It will be interesting to see how much variation there is among the final products. I just love the retro candle paper! It reminds me of when I was a kid, putting up the holiday decorations with my parents, siblings, and some hot cocoa! 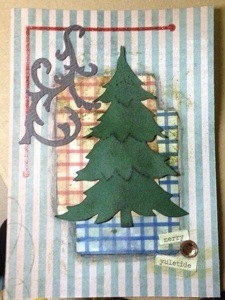 Ingredients: Core’dinations cardstock, Tim Holtz seasonal paper and seasonal salvage stickers, distress inks, stickles, a Sizzix Christmas tree die… I think that’s it, I was pretty tired when I finished!